Do you want to get The Last Best Box or send it as a gift, but can't wait until the next month's box is shipped? 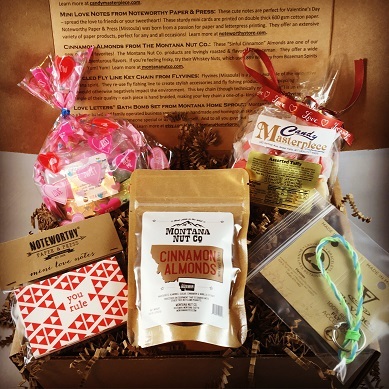 Consider one of our 2019 February Boxes! It includes Cherry and Vanilla Taffy from Candy Masterpiece (Great Falls), Mini Love Notes from Noteworthy Paper & Press (Missoula), Cinnamon Almonds from The Montana Nut Co. (Bozeman), “Love Letters” Bath Bomb Set from Montana Home Sprout (Ramsey), and Recycled Fly Line Key Chain from Flyvines (Missoula). This box is separate from the monthly subscription, and can be shipped anytime. We use USPS 1-3 priority mail, and generally ship your box 1-3 days after you place your order. Contact us if you have any special instructions or questions. Cheers!